There is no doubt I love flowers and green plants, just look at what I photograph. Here is a flower I photographed last night. In some of the Buddhist texts this is known as the Kamala flower, which is used (along with the Lotus flower) to adorn various deity statues and drawings. 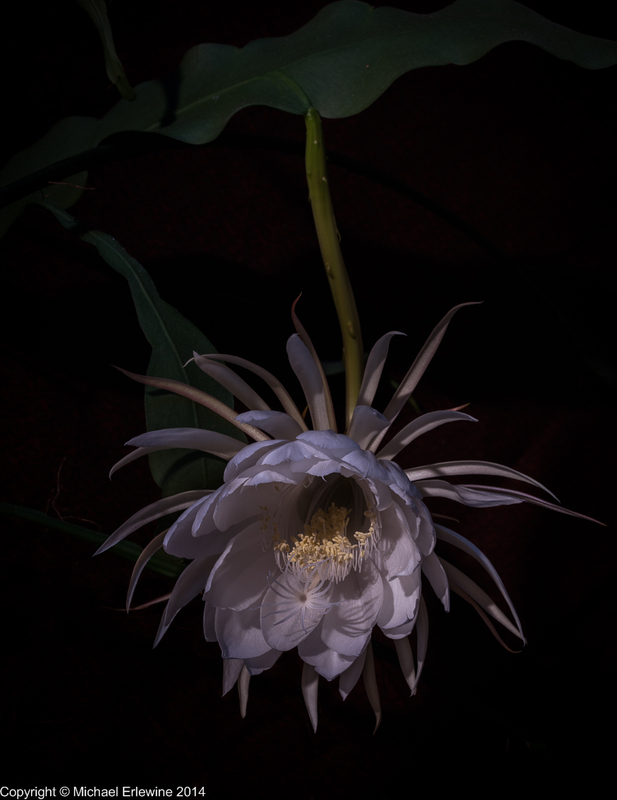 This one is also called the Night-blooming Cereus in popular speak, and it only blooms one night a year and can be about a foot long. There is no other flower in the world that I am happier to see than this one. And aside from its beauty, it has the single most beautiful fragrance I have ever known, so piercing that it literally goes into your brain, deeply. It is like spiritual smelling salts, one whiff and you are all tune in. Well, this big sprawling plant lives in our bedroom and the single bloom for this year bloomed all night. When the sun comes up this morning, it will be done, hanging there like a tired sock. While I am on flowers, I might as well tell you about the time that Margaret and I went into the green plant business and ended up managing greenhouses in Florida with 19,000 Square feet of glass? Well, that happened. I will try to make this brief, but it will stretch out a bit. Margaret and I were married in July of 1971 and we lived at 114 N. Division, what was called at the time the “Prime Mover House,” because that was the name of my band, and most of the members used to live there. Anyway, I had one room and a second very narrow entry-way room that was crammed with books from floor to high ceiling, and so on. For some reason around that time I began to collect potted plants. Before I knew it, every inch of window space, every little bit of light, was crammed with shelves of plants. Plants were everywhere. And I was studying them. I don’t know why, except that I like plants and flowers. They are beautiful. All these plants was a sign of something, but what? Well, the “what” was an abandoned broken-down greenhouse in Evart, a town in northern Michigan. For some crazy reason I wanted to have that greenhouse, so after what amounts to a lifetime in Ann Arbor, I resolved to move up north, restore, and run that greenhouse complex. Of course I had no money. So I decided to sell everything I owned, a vast amount of books and an enormous number of records ( I still have 40 feet of albums that did not sell). Margaret told me later that she would have preferred to stay in Ann Arbor and enjoy the little mandala I had created there, but I did not know that at the time. So we left Ann Arbor, just moved out, and found ourselves in a tiny very dark apartment in Evart, Michigan that was part of these greenhouses. And it was all run-down. None of the three greenhouses were working and they were attached to a little store, above which was this tiny apartment where we lived. And it was a wee bit spooky at night. There were lots of long dark hallways, abandoned stuff, and, of course, the boiler room, by far the scariest place of all. The boiler room in the basement contained a huge boiler that was the size of the front of a locomotive, and it produced steam enough to power all the greenhouses and whatever else was attached. Well, it had a life of its own. I kind of had to sneak up on it to even get near. And there it was, with its flashes of flickering flames in the dark, hissing and moaning like some great beast. And I had to treat it nice, turning on this or that valve just so, letting water in of a certain amount and, most of all, watching the pressure indicators to make sure that damn thing didn’t blow up. Obviously, since winter was coming on, this huge beast was the heart of the greenhouse experience. race to close them up so they could be heated before winter. There were broken glass panes everywhere and the putty had all gone out of the wood, so there I was, from morning to night, high in the rafters puttying and replacing glass, working against time to seal the place. And Margaret, brave soul that she is, was right in there helping. I remember one day coming into one of the greenhouses and there she was on a ladder, reaching up and struggling to clean the glass as suds and water rolled back down her arms, soaking her completely. There were tears running down her cheeks, but game person that she is, Margaret was hell-bent to get that glass clean. And that is kind of how it was. In the end, we only got one of the greenhouses closed in and running. Winter was already there and I found myself on the road every day with a truck full of little tropical plants wholesaling them to flower shops across the state. I had sprayed the inside of my van with foam to keep the plants warm and on the sides of the white van, in dark green paint, it read “Erlewine Plants.” I was always the entrepreneur. This story is already too long, so I will skip the part about where we lost everything and I ended up being hired to run large greenhouses in Apopka, Florida, the tropical-plant center of the state. That is a whole other story, but I will leave this topic with one tale from up north. It is about that beast of a boiler. One day I, when I was probably ninety miles from our greenhouses, I received a call from Margaret to the effect that she had forgotten to turn off the water to the steam boiler and it had overflowed and now the basement boiler room was knee deep in water and who knows what the boiler was doing. Help! Driving as fast as I dared, I got back home driving as fast as I could drive and, with the help of a friend, we waded into that dark hole. With boilers and steam pipes (5" diameter steam pipes) typically the wrenches needed are like 4-feet long and take two men to turn them. They weighed a lot. I will never forget struggling through that water and looking that fierce boiler in the eye. There were little red flames of fire flashing from its face. I had no idea if it was about to die or blow up. That’s how much I knew about boilers, and this boiler was bigger than a car. Gradually we stabilized it. And as if scrambling the greenhouses before winter was not enough, our two English Bull Terriers managed to get together (against our will) and suddenly we had a whole litter of puppies. It was cold out and the tiny apartment we lived in that was part of the greenhouses complex happened to be the only warm place. We raised those puppies in our kitchen. Please don’t ask me for details. You wouldn't like them. The greenhouses were hard work with long hours, but, as usual with me, I loved every minute of whatever my latest project was. However, the business end of things was all downhill. We produced a great product, but as it turned out the little flower shops across the state were afraid to give us the business and thumb their noses at the big conglomerates. And they were right! We did not last long with no customers. I don’t know if any of you have ever spent real time in a working greenhouse, especially in winter. It is warm, tropically moist, and filled with light and wonderful plants. Just going into it in the morning was a treat. If only time could stop and I could stay among the plants in that tropical spell. But no, time moves on and, as our money ran out and no business appeared, that happy place was doomed. About our only escape was driving that old van to my parent’s house, some 30 miles away, for dinner every once in a while. There Margaret and I would be, a six-pack on the engine mount of the truck between us, popping those cans (that is what folks did back then), and driving into the sunset, happy to see my mom and pop. Those are real memories. Also quite real, and more sobering were the times that infestations of whiteflies and other plant bugs caused us to have to bomb the entire greenhouse with poison gas. It was a little more complicated than that because our apartment was part of the greenhouses and, with paper-thin walls, there was no guarantee that the deadly gas would not just creep in and kill us as well as the bugs. So, there we are again, driving into the sunset, but with two adult dogs and a complete litter of puppies along with us. God bless my mom for being so receptive! She allowed the whole bunch of us, puppies and all, to stay over until that deadly gas was inert. And of course she fed us! The demise of the greenhouse project involved selling off all my stock to the big-plant boys, and eventually accepting a job from one of them managing, of all things, greenhouses. The only problem was that the job was in the greenhouse-capitol of the U.S., Apopka, Florida. So off we went to Florida, Margaret and myself, our two dogs, and what was left of the puppies, plus all our worldly belongings in a 1966 Dodge van. We detoured through Nashville to drop off one of the puppies and then straight on to Apopka. How different it was to be where it was warm, to walk through greenhouse after greenhouse (19,000 sq. ft. of glass) and see volunteer plants under the benches competing with their for- sale cousins in the beds above. Florida is all about plants. I loved it, and knew all about soil mixes, and how to grow these little seedlings. But there was, as too often is the case, trouble in paradise. For one, there was the moldy house/cottage we had to live in. There is so much humidity if Florida that the inside walls of our home had mold, and the shower/bath and refrigerator were green scum beyond belief. I had to work the plants, so I am afraid this left dear Margaret struggling to clean (with not enough help from me) that impossible-to-clean house, and she was a trooper. It took her a week of scrubbing just to get the mold out. There was not even a window in the bathroom, so you can guess what that was like. It did have a large screened-in porch off the back that was like sitting near the edge of a jungle. It probably was. About our only escape there was a little Italian restaurant down the road that let you bring in your own beer in a brown paper bag, and drink it while you enjoyed their food. We would steal off there every once in a while, but not really that often. And they had a drive-in theater. I bet some of you younger folk reading this may have never even been to one. This one had all the trimmings. It was like a warm summer evening every night in Florida, and the drive-in was all grass like a carpet. We would bring whatever we wanted to drink and watch movies into the wee hours. Of course, we maybe only had time for this once or twice. loved the smell and feel of large greenhouses. How wonderful! But in such a fertile environment the plant bugs had total encouragement and just went wild. They could never be eradicated; even management of them was touch and go. And it took poison, of course, to even do that. And the particular poison it took was Parathion, a very deadly poison that is cumulative, which means that every exposure to it adds up until one day you just keel over. Well, I knew how to manage that. What I could not manage was the migrant workers who refused to understand that Parathion kills. They only too readily handled it, and let the deadly white dust wedge itself in their belts, against their skin, and so on. No amount of explaining seemed to help. And the management up north cared not a whit, no matter how many times I pointed out the danger. Simply put, they did not give a crap what happened to the workers. Well I did, and soon gave management an ultimatum. They either had to change the policy and educate the workers or I quit. Well, it turns out I had to quit and before we knew it, Margaret, myself, our two dogs (and what was left of our puppies, plus all our stuff) were in the van again and heading back to Michigan in the dead of winter. We slowly drove back up through Georgia and the Southern states back to Michigan and Ann Arbor, the whole lot of us, including our two dogs and what remained of our puppies. We had nowhere to go. I had left my home of seven years and someone else was living in my rooms. I had given up my job at Circle Books, my brothers metaphysical Bookstore. I was kind of limping back to a home we did not have. Thank goodness that my old friend Jay Walker had an attic that was free and that is where the whole lot of us landed, puppies and all. I don’t need to tell you what corralling a bunch of puppies and two adult dogs, plus ourselves, in one room attic was like. It was like what you think it was like. And it lasted until spring. Oh well. That was the end of the plant business, but as it turned out, I was headed toward becoming a full-time astrologer once I found out that Margaret was pregnant. We were going to have a baby! But that is another story.